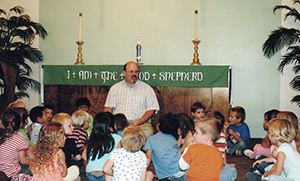 Good Shepherd Lutheran Church was organized as a mission in 1959. The Southern California District had previously purchased a six-acre parcel of land and Rev Loren T. Kramer was called from the seminary to begin the work in Goleta. The sanctuary was built and occupied by the second anniversary of the congregation, with other buildings coming at a later time. Throughout its history, Good Shepherd has been deeply committed to both the preaching and study of God’s Word. In order to better serve the community and its children, a pre-school was established in 1986 and it continues to function as an arm of the congregation. Good Shepherd is involved in community in many ways, and allows usage of parts of its large area of land for a variety of projects. The congregation is a part of the Pacific Southwest District of the Lutheran Church-Missouri Synod, a grouping of more than 6,000 congregations with over 2.7 million members throughout the United States. As we belong to the Synod, we also remain self-governing: while, at the same time, sharing a common faith and goal with all other congregations of the Synod.